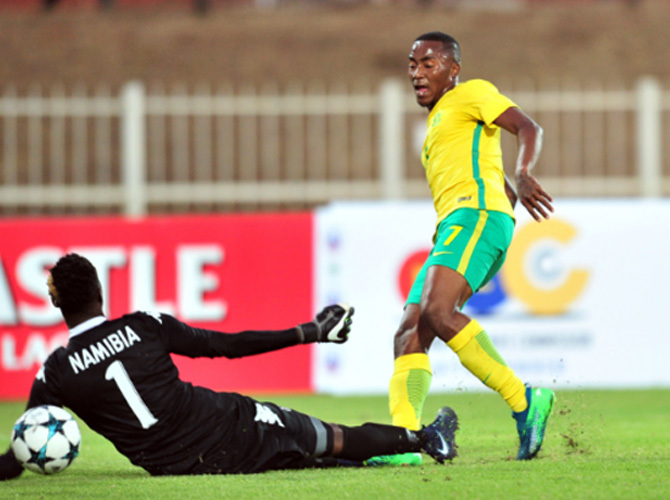 Lebohang Maboe, Siyanda Xulu, Fortune Makaringe and Siphesihle Ndlovu were at the forefront of Bafana Bafana’s 4-1 thumping of Namibia in a COSAFA Cup match in Polokwane. Maboe was at his marauding best at the Peter Mokaba Stadium on Tuesday, netting a brace with goals in the 28th and 41st minutes, following an Aubrey Modiba penalty in the 26th minute. Bloemfontein Celtic winger Deon Hotto gave the Namibians hope when he scored six minutes before the interval. But Maritzburg United centre-back and PSL Defender of the Season Siyanda Xulu, who was captaining Bafana, popped up in the 55th minute to make it 4-1. Maboe, who won the Nedbank Cup Player of the Tournament and Most Promising Player awards, was named as Man-of-the-Match after his exploits in the Limpopo. The Team of Choice playmaker felt he could have had a hat-trick, but was nevertheless pleased to have helped Bafana bounce back after they had lost on penalties to Madagascar in their first game of the COSAFA Cup. “I think we came back very strong,” Maboe said. “We know that we lost our first game and we had showed character coming into the game, which we did very well, hence we won the game. “If I was a lot more composed, I think I was going to score the third goal but it did not come. I’m just glad we did well as a team,” he added. Bafana will now face Botswana in the Plate final after the Zebras beat Lesotho 2-0. CUP FINAL TRAVEL PACKAGES FOR MUFC SUPPORTERS!